Can smart electrical systems that require businesses to have onsite back-up power pay off? Lee Spring designs and manufactures custom springs, wireforms and stampings made to your specifications. 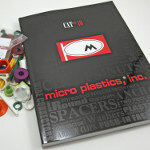 Request a quote today for prototypes through large scale production. Lee Spring engineering and manufacturing expertise will keep you on time and on budget. Extensive custom material and finish options available. Lee Spring offers a large choice of finish and plating options. ISO 9001 certified and ITAR, Reach, and RoHS compliant. In the past few decades, we've witnessed the evolution of materials used in 3D printing, marveling at the use of plastics and metal, composites, carbon fiber, and more. Now there's something even more "attractive." 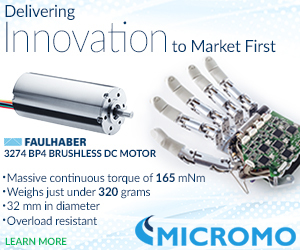 Check out the massive continuous torque of the FAULHABER 3274 BP4 motor. Whether you live in the United States or Denmark, Germany or Ireland, chances are you’d like to see more manufacturing in your own country. On the face of things, it’s hard to argue with offshoring. But what initially promised to be an easy bump to the bottom line can soon become fraught with quality problems, late deliveries, hijacked intellectual property, and urgent after-hours telephone calls. Learn how to make a solid business decision that incorporates all of the tradeoffs -- and some you may not have thought of. The flat-screen TV on your living room wall could soon be remotely charging any device within its line of sight. Well, not your actual TV, but a device that is similar in size and shape. Engineers at Duke University, the University of Washington, and Intellectual Ventures’ Invention Science Fund have demonstrated that the technology already exists to build such a system -- it’s only a matter of taking the time to design it. Designing and building robots requires tools that can not only handle the technical complexities involved, but also mitigate the long timescales and high costs often associated with this endeavor. System-Level design tools, like MapleSim, provide a time- and cost-effective tool for the design and development of complex robots. These tools allow engineers to design and test virtual prototypes to address issues early in the design process and eliminate costly changes later on. Rolls-Royce has run the world’s most powerful aerospace gearbox for the first time, marking a significant step in the development of its new UltraFan engine design. The maiden run of the Rolls-Royce Power Gearbox (PGB) at the company’s facility in Dahlewitz, Germany, marks the start of a series of tests that will see the gearbox reach up to 100,000 hp. A mini robotic cell developed by German integrator Paul von der Bank is in operation at Bruninghaus & Drissner in Hilden, Germany, just east of Dusseldorf. In the confined space of this portable “Welding To Go” (WTG) 1200 cell, a KUKA KR 6 R 700 sixx robot from the AGILUS series performs welding tasks with precision three shifts a day. The whole unit works in a footprint the size of a wooden pallet -- about 40 in. x 48 in. Watch the mini robot welder in action. Designing parts with consistent wall thickness is a fundamental rule of plastic injection molding, and ignoring it can lead to sink, warp, and inaccurate or non-functional parts. Yet the functional requirements of consumer, medical, aerospace, and industrial products often leave designers little consideration for the material flow and fill properties of plastic, both of which are at least partially determined by wall thickness. Gus Breiland of Proto Labs gives his invaluable tips and tricks. 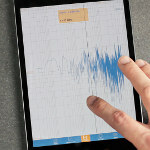 The original VibroChecker app from Ace Controls uses the acceleration sensors, gyroscopes, and microphones integrated in the iPhone and iPad to measure vibrations on machines and components within a frequency range up to 50 Hz. Upgrading to the new "PRO" version of the app increases the range to 8,000 Hz. The user simply has to connect an external USB sensor (available from a third party) to the iOS device via the lightning port and an adaptor. Measurement results can be saved or emailed. The custom-designed, low-cost Whisperjet valves from Conval are simple, practical, long-lasting devices that reduce liquid or gas pressure through a series of multi-pressure reduction stages. As a result, there is virtually no part erosion. 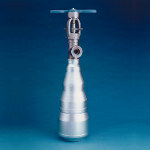 With steam applications, noise is significantly reduced because orifices on each stage are sized to keep the flow of steam below critical velocity. 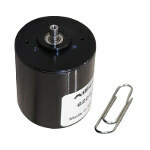 The new 28-mm, 24-V ResMax 28 brushless motor from Allied Motion is engineered to achieve very high speed (up to 90,000 rpm) with great dynamic responsiveness (0 to 50,000 rpm in only 20 ms, unloaded). It has exceptional operating life (30,000+ hours at 40,000 rpm average speed), maximal efficiency (up to 90 percent), rated power of 46 W, and the ability to operate in an oxygen-rich environment. The motor is equipped with integrated Hall-effect sensors and a NTC thermal sensor. The BlueWave MX-150 from Dymax is a new smaller LED spot-curing system that can be used as a bench-top unit or integrated into an automated system. Its LED emitters are available in 365-nm, 385-nm, or 405-nm wavelengths. This system is uniquely designed to offer higher, more consistent curing intensities than traditional spot-curing systems. The emitter can be easily mounted to robotic arms or mounted further from the controller without fear of intensity variations. Researchers at Georgia Institute of Technology have developed a new process for treating metal surfaces that has the potential to improve efficiency in piston engines and a range of other equipment. The method improves the ability of metal surfaces to bond with oil, significantly reducing friction without special oil additives. NASA is developing and validating a system that will allow part of an aircraft's wing to fold in flight. The aim is to test the feasibility of increasing efficiency through wing adaptation. The concept would permit the outboard portions of the wings to move to the optimal position during operation, which could potentially result in an increase in efficiency by reducing drag and increasing lift and performance. 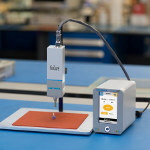 The desktop waterjet machine called WAZER (made by a company of the same name) has raised almost $1.5 million since September, blowing past its original $100,000 crowdfunding campaign goal for the super-powerful cutter designed for hobbyists, artisans, and small businesses. A third round of machines (Batch 3) is being pitched on Kickstarter for delivery in late 2017. 3D Systems On Demand Manufacturing, Quickparts is the provider of 3D-printed parts for components, tooling, and machinery for all industries. We specialize in delivering advanced prototyping and manufacturing solutions, using traditional and additive manufacturing technologies, materials, and finishing options. With instant online quoting from anywhere in the world and a global team of 3D-printing experts committed to Customer success. Get started by visiting us online at www.3dsystems.com/quote. What was wow-worthy at the 50th anniversary SEMA show in Las Vegas this year? AutoGuide.com runs through their Top 5 picks at this event aimed at the aftermarket crowd. Their choices include a 2,000-hp Toyota Land Cruiser and an intimidating-yet-cool mash-up between the Ford GT and Mustang that you can actually order.